Fundamentalism has become the face of Islam in the West. It was not always so and need not be in the future, says Tim Stanley. As the debate continues on the causes of last summer’s English Riots, Michael Roberts examines previous attempts by reformers to address moral malaise and social breakdown. As the debate rages about how history should be taught in state schools David Cannadine discusses his recent research project. Hitler's future companion was born in Munich on February 6th 1912. John Herschel Glenn Jr was the first American to orbit the Earth on February 20th 1962. Otto I was crowned Emperor of the Romans by Pope John XII on February 2nd 962. 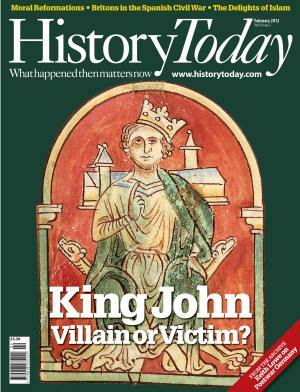 For centuries King John has been regarded as the embodiment of an evil ruler. But, says Graham E. Seel, this image is largely the creation of monastic chroniclers with an axe to grind. A close examination of contemporary records reveals a more nuanced character. Hugh Purcell tells how Kitty Bowler, a young American, captured the heart of Tom Wintringham, the 'English Captain' at Jarama. Christopher Allmand examines Alain Chartier’s Le Livre des Quatre Dames, a poem written in response to the English victory at Agincourt, and asks what it can tell us about the lives of women during this chapter in the Hundred Years War. The year 1812 was a turning point in the career of the industrialist Robert Owen. Ian Donnachie examines his Essays on a New View of Society, in which Owen first aired the ideas about popular education and workers’ welfare that would make him famous as a reformer. Richard Almond has trawled medieval and Renaissance sources for insights about ladies’ riding habits in the Middle Ages and what they reveal about a woman’s place in that society. Roger Hudson explains the story behind a 19th-century photograph of George Washington's mausoleum. Is Britain more European than it thinks? long historical narrative, argues James Ellison – but it is not the whole story. Contemporary culture places a high premium on novelty. Armand D’Angour argues that we should consider the more balanced views about old and new found in classical Greece. Keith Lowe on the dilemmas faced by a victorious but financially ruined Britain in its dealings with postwar Germany. With Italy on the brink of financial collapse and in deep political crisis, the country’s 150th anniversary has been a dramatic one. It is especially timely, then, to take stock of new research into this most contradictory and enigmatic of countries. Robin Whitlock asks if studies of the decline of societies such as that of Easter Island can shed light on contemporary concerns. The British Battalion of the International Brigades, formed to defend the Spanish Republic against the forces of General Franco, first went into battle at Jarama in February 1937. It was the beginning of a bruising, often dispiriting campaign. When the world’s population reached seven billion it prompted a great deal of nonsense to be written about Thomas Malthus. Robert J. Mayhew sets the record straight. The actress behind the Spirit of Ecstasy, the mascot on every Rolls-Royce, and other women who have inspired famous emblems.